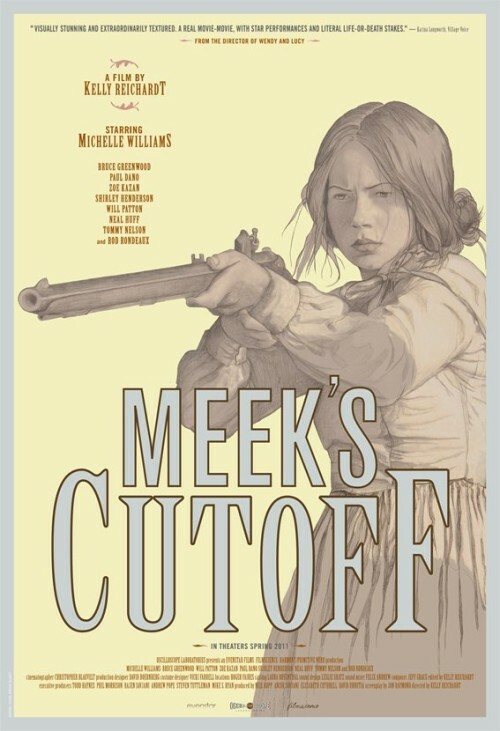 Meek’s Cutoff — which probably refers to the abrupt ending. This is a great movie if you like stories with no point, nothing of consequence happening, and there is no ending. Filmmakers would probably categorize this as a “slice of life” and probably a “historical” or “character” study. That doesn’t make is necessarily a bad film, but one that requires a different approach going into it. Traditional storytelling need not apply. There is one scene is particular that reflects the film as a whole. Emily (Michelle Williams) runs across a lone Native American during the long journey on a three wagon train across 1845 Oregon. In a panic, she runs back to the wagons to fire a signal warning shot to bring the men back for help. In one long shot, she arrives at the wagon, flustered. She grabs the rifle. Cleans the barrel. Fills with gun powder. Checks the flint. Pulls the hammer back. Fires in the air. Then…. she does it all over again for a second shot. The whole event felt like three days. The scene is slow and methodical, but there is a precision staying true to historical accuracy. In the amount of time that she takes to fire two shots, John McClane would have gunned down 14 bad guys. The film overall is like this. Attention to the slow plodding reality of families travelling West 150 years ago. Its not exciting. The cinematography gives the appropriate desolation as the sun beats down that the travellers run out of water. Acting is great — again — if you like to watch people sit and talk to one another rather than DOING things. Williams presents a soft-spoken, but very strong woman. Bruce Greenwood’s representation of Meek, the tracker who has gotten our travellers lost but won’t admit to it, is absolutely spot on and makes you roll your eyes as you would at the local stoner who shows up, sits on your couch, and pontificates on how the government implants trackers into every newborn as part of the New World order — because he heard it from a guy. The Native American, played by Rod Rondeaux, who the travellers feel can help find water, is presented without subtitles, in another step toward historical veracity, because there is a very large rift between the understanding of the two cultures. A rift that the filmmakers would like the audience to be part of. Overall, a very well produced film, but not very entertaining. And in the end, the main question is “what happened?” It would make a good presentation in a class on American History, though.